It was hard for me, this time around, to forget the book while watching the movie. I’m not saying that the book is a literary classic, just that it gets quite dense and lengthy. Any sort of attempt to cram the essential elements of the book into a film would be difficult, and this time I’m afraid the filmmakers were not up to the task. Harry Potter and the Prisoner of Azkaban [review here] was quite successful in paring down the book into a manageable length, while maintaining an exciting and engaging narrative. Harry Potter and the Goblet of Fire, however, manages to be lengthy without being exciting, and hardly manages to be coherent at all. The story for Harry Potter’s (Daniel Radcliffe) fourth year at Hogwart’s involves the Tri-Wizard Tournament, a competition designed to increase international magical cooperation. Forthwith, we are introduced to students from two foreign schools: Beauxbatons in France and Durmstrang from up north. The magical Goblet of Fire chooses one champion from each school: Viktor Krum (Stanislav Ianevski) from Durmstrang, Fleur Delacour (Clémence Poésy) from Beauxbatons, and Cedric Diggory (Robert Pattinson, pre-Twilight fame) from Hogwarts. Of course, it wouldn’t be a Harry Potter adventure if someone didn’t surreptitiously throw Harry’s name into the Goblet, ensuring that he would be the fourth champion. But there may be something fishy afoot: the Tournament is very dangerous, demanding feats such as getting by fiery dragons and rescuing underwater hostages. 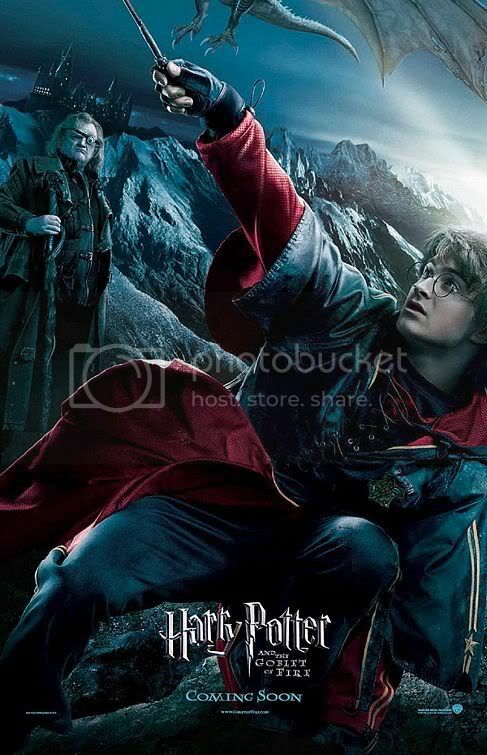 Perhaps whoever put Harry’s name in the Goblet is hoping Harry will be killed in the Tournament. And what if these nefarious goings-on have something to do with Lord Voldemort’s possible return to power? This is all well and good, but with this much going on in the plot shouldn’t the movie be exciting? Shouldn’t we care about the characters in their dangerous encounters? Unfortunately, this film rarely engaged me, and I think most of the reason why has to do with the film itself. The characters are all present, the big set-pieces are all there, and some of the dialogue is intact. It was just put together so poorly in movie form that I was turned off. To begin with, the editing and directing is generally sub-par. Simple shots of two characters are poorly framed, and even the occasional close-up doesn’t look right. The editing only serves to compound matters, with many scenes cut so short as to lose their significance. I suspect that many scenes were a great deal longer, and in an attempt to save some time they just trimmed a couple minutes from many of them. The result is a horde of horribly chopped scenes. Characters are speaking and it feels like they have more to say when they are rudely interrupted by the next scene. The resultant choppiness also greatly affects most of the exciting moments. By the time Lord Voldemort rises from the cauldron (a part of the book which thrilled me) I was totally unmoved. Ralph Fiennes does a fine job as Voldemort, and his makeup is effective, but I was not terrified or excited in the least. The previous two hours of the film had left me impotent. The effects in this film also aren’t quite up to the standard set by Harry Potter and the Prisoner of Azkaban. The CG is used sparely, to be sure, but at times I was still not totally enveloped in the film. I almost wonder if the film would have been better served by cutting more scenes from the book and more fully developing the remaining scenes. Perhaps a focus on quality over quantity would have enhanced the story. As it is, this is a generally lifeless entry into the Harry Potter-movie canon. This entry was posted in 1 pirate flag, 2 stars, H, Movie Reviews on December 4, 2009 by Tim Irwin.